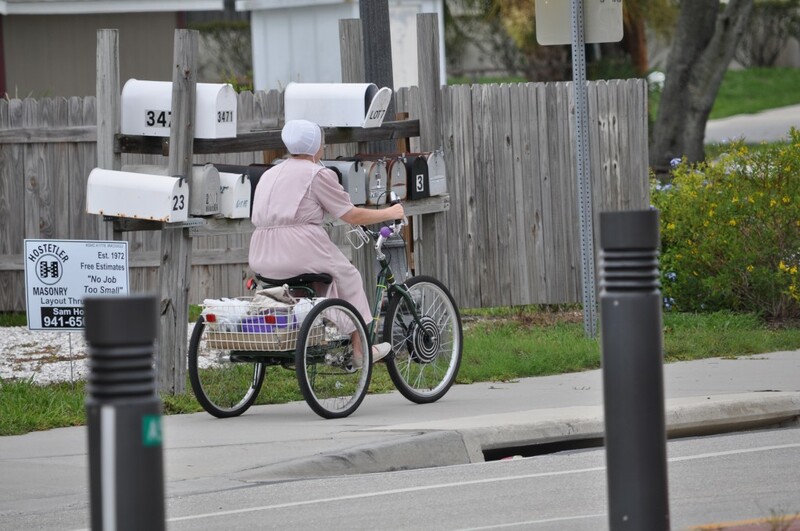 Pinecraft, Florida Amish: One of my favorite Amish settlements is the winter enclave of Pinecraft, Florida. Twenty years ago few people outside Plain circles had heard of this Amish paradise. Now this corner of Sarasota – while still quaint – is filled with sprawling Amish-style restaurants and shops. Yes, the Plain people still come to escape the winter chill, but so do a lot of other people. Twenty years ago there were fewer Amish people in general everywhere (some researchers estimate the Amish population doubles every generation, fueled by high birthrates). So Pinecraft was a sleepy corner of Sarasota where Amish people descended to play shuffleboard and spend the winter. Despite the increased spotlight, the village still holds a certain charm and mystique. The Pinecraft, Florida Amish community has its own charm and customs, it’s own cuisine and color. Sample the settlement at Yoder’s Restaurant, which offers amazingly authentic Amish cuisine and then visit Pinecraft Park and watch the locals and Amish mingle over shuffleboard. You also need to plan on visiting nearby Siesta Key Beach, one of the best beaches in the USA!